Martin Stoyanov recently asked an excellent question about the proper way to push revisions to a changeset in Gerrit. This is a very common question that folks new to Gerrit or Git have, and I think it deserves its own post. When you do the first push of a local working branch to Gerrit, the act of pushing your code creates a Gerrit changeset. The changeset can be reviewed, and in the process of doing that review, it’s common for reviewers to request that the submitter make some changes to the code. Sometimes these changes are stylistic or cosmetic. Other times, the requested modifications can be extensive. Are the changes requested mostly stylistic or cosmetic? Are the changes requested going to provide additional functionality that is dependent on the existing changeset? Are the changes requested going to provide additional functionality that is independent of the existing changeset? If all you did was correct typos and whitespace, simply leave the commit message as it was originally. 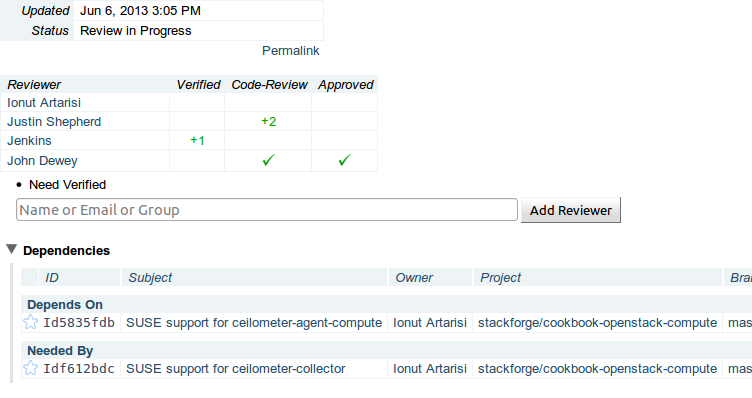 After the call to git review, you will see a new patchset appear in the original code review. This is expected. The changeset is still viewed by Gerrit and reviewers as a single changeset, and reviewers may even select “Patchset 1” from the “Old Version History” dropdown instead of “Base” in order to see only the changes made in this last amended commit. Whenever you do not amend a commit and issue a call to git review, you will be created a dependent changeset. Gerrit will assign a new Change-Id to the patchset, but understands that the commit logically follows your original changeset’s code. If you go to the code review screen of your newly-created changeset, you will see your original changeset referenced in the “Dependencies” section. Below, you can see a screenshot of a changeset that is part of a “dependency chain”. Another patchset is dependent on this patchset and this patchset is dependent on another patchset. It’s best to avoid long chains of dependent patchsets. The reason is because if a reviewer requests changes for one of the changesets at the “bottom” of the dependency chain, the entire chain of changesets (even changesets that are approved like the one shown above) are going to be held up from going through the gate tests. If a reviewer has requested extensive changes, but points out that the changes they want made are actually independent of the changes in your original commit, the reviewers will generally ask the original committer to wait until this changeset is merged and create a new branch for the additional work. Normally, depending on the extent of the requested changes, reviewers will insist that the submitter create a new bug or blueprint on Launchpad to keep track of the additional work they feel is needed. Prefer to amend the original commit. In most cases, this is the appropriate solution to push revisions to Gerrit. Don’t include sausage-making comments in the commit message. Prefer free-standing changesets to long chains of dependent patches. Ask reviewers what their preferences are. Follow those guidelines and you’ll keep yourself out of the weeds. For more detailed information, including strategies for handling updates to your code that is dependent on another branch of code that gets updated, see the excellent OpenStack GerritWorkflow documentation.